This past week was an up-and-down one for the Calgary Flames, to say the least. Following their five-day break, the team came out flying on Monday night against the Arizona Coyotes, registering 19 shots on goal in the first period alone. Finding themselves unable to beat Mike Smith early, however, the Flames then fell flat on their face in the second and third periods, en route to a 5-0 loss. Redemption came on Wednesday night, when – hosting the Philadelphia Flyers – the team eked out a 3-1 victory in a game where their heads still appeared to be away from the rink. After following up that win with a wild overtime loss to the Vancouver Canucks on Saturday, the Flames finished the week with a 1-1-1 record. Technically a .500 week, but the team would’ve been hoping for more coming out of their break. Motivation was likely not hard to find for Matt Bartkowski on Saturday night, heading into his first NHL game in almost a year, and doing so against his former team. With Ryan Miller standing on his head for the Canucks all night, Bartkowski was hardly the only Flame who failed to register on the scoresheet, but Bartkowski acquitted himself nicely in his first contest with Calgary. While he saw just shy of eleven minutes of ice time – lowest among Flames defensemen – Bartkowski did well with the time he was given. Moving the puck well, avoiding costly turnovers, and driving possession were all positives of his first outing. Looking at the possession numbers, you can clearly see how the Flames carried the play for the majority of the game against Vancouver, with Bartkowski being no exception. His Corsi rating of 75 in Saturday’s contest was second only to the outrageous 83.3 posted by Dougie Hamilton. 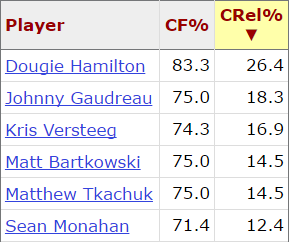 Bartkowski also managed a relative Corsi of 14.5, second again only to Hamilton among all Flames’ blueliners. No verdicts can be made on the Bartkowski signing after one game, especially for a player who’s prone to having games like this followed by turnover-laden outings the next time out. But, for a team struggling with the transition game and controlling the puck when the top pairing isn’t on the ice, it was refreshing to see Bartkowski have a strong first game with the club. Giving up a goal from center ice is a goalie’s nightmare. So when Brian Elliott did just that early in the first period Saturday night, it looked like it might be a long night for the Flames’ netminder. Following the knuckle-puck from 80 feet out, though, Elliott rebounded fantastically for the rest of the night. Despite ultimately losing in overtime, Elliott held his own very well in a game that was a goaltending duel throughout. After Chad Johnson was pulled in the loss to Arizona on Monday, Brian Elliott followed it up with two games against Philadelphia and Vancouver where he allowed just three goals on 53 shots, and helped the team pick up three of a possible four points in the process. The Flames have been waiting for one goalie to step up and take the reigns, and Elliott has done just that since the calendar turned over to 2017. 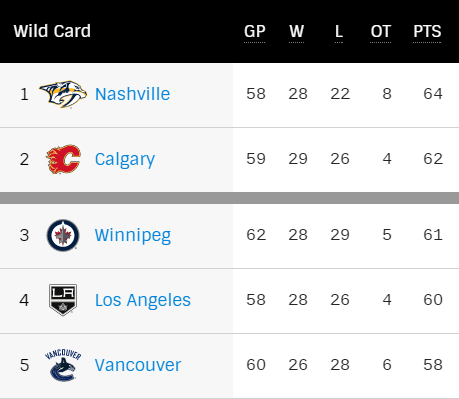 With only 23 games remaining on the schedule, the Flames head into their last few games before the deadline holding on to the final playoff spot in the west. 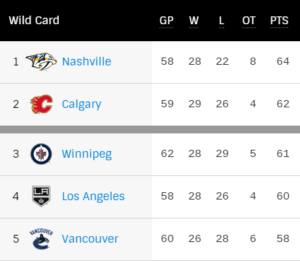 A tough week ahead sees Calgary continue their five-game road trip, highlighted by a crucial contest tomorrow night against the team two points up on them in the wild card race – the Nashville Predators. Following this contest, the Flames will head to Florida for back-to-back contests Thursday and Friday against the Tampa Bay Lightning and Florida Panthers. It goes without saying that the game against the Predators will be the biggest of the week, with an ability to not only pull even with Nashville, but also create some more separation between the Flames and those chasing them. With only five games remaining before the March 1st trade deadline, it will also be interesting to see how different each of these teams might look a week from now. Don’t expect too much from the Flames, but we might see a lower-cost move or two that could help the team not only this year, but moving forward as well.